Rolls-Royce and Goa Shipyard Limited (GSL), a premier defence shipbuilding yard in India under the Ministry of Defence, have agreed to cooperate in the local manufacturing of technologically-advanced MTU Series 8000 engines in India. 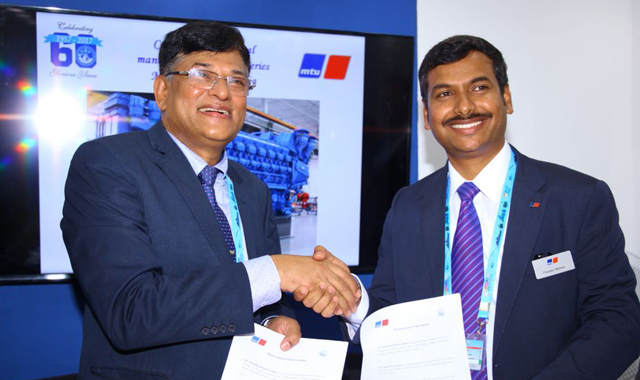 Under the agreement, which was signed on Thursday, April 12th at India’s leading defence trade show Defexpo, the companies will assemble the 16-cylinder and 20-cylinder MTU Series 8000 engines at GSL’s new facility in Goa. The MTU brand is a worldwide leader in large diesel and gas engines and complete propulsion systems and part of Rolls-Royce Power Systems. The agreement includes transfer of MTU technology related to localising of engine components, engine assembly, testing, painting and major overhauls. MTU Series 8000 engines are the largest and most powerful MTU diesel engines with a power output of up to 10 MW. They are fitted onboard all Offshore Patrol Vessels (OPV) recently constructed or currently under construction in India. This includes eleven Coast Guard OPVs by GSL (six completed and five under construction), five Naval OPVs under construction at Reliance Defence Engineering and seven Coast Guard OPVs by L&T. RAdm (Retd) Shekhar Mital, NM, Chairman & Managing Director of GSL said: “In line with the thrust on indigenization and ‘Make in India’ initiative of the MoD, Government of India, GSL has been on the forefront for increasing the indigenous content onboard vessels constructed at GSL. Since main diesel engines constitute the heart of a ship and are among the major high value imported equipment items onboard ships, the collaboration will aid to significantly increase the indigenous content onboard ships constructed in India. It will also provide a strategic edge to Indian Defence Sector as know-how and infrastructure for such niche technology will now be available with a PSU Shipyard, which can be gainfully utilised by the Indian Navy and Indian Coast Guard. For some time we have been on the lookout for acquiring such technology of marine propulsion engines and we are thankful to our partners Rolls-Royce and MTU Friedrichshafen for choosing us as a collaborator. Under the agreement, we will be catering for marine propulsion requirements within the country in the range of 7 to 10 MW. The new facility being created by GSL will also undertake all major overhauls of these engines.